Another re-post from the Ghetto Tyylit archives. "Solo EP by A-O.N.E. 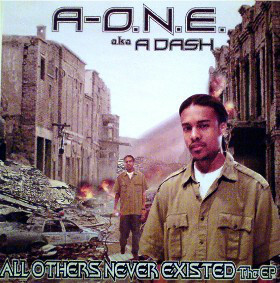 (aka A Dash).. This was released in 2003 so it sounds a bit different than the earlier Daysmen Empire stuff." This Is For The Hustlers is dedicated to the independent hip hop scene and the do it yourself mentality of releasing music. None of the files are hosted on this site. If there is something posted you have a problem with please email me. The music posted on this site is for listening and previewing purposes only. If you enjoy something please support the artist and buy it. If any of the music on this site was taken from other blogs/websites, thank you to the original poster.